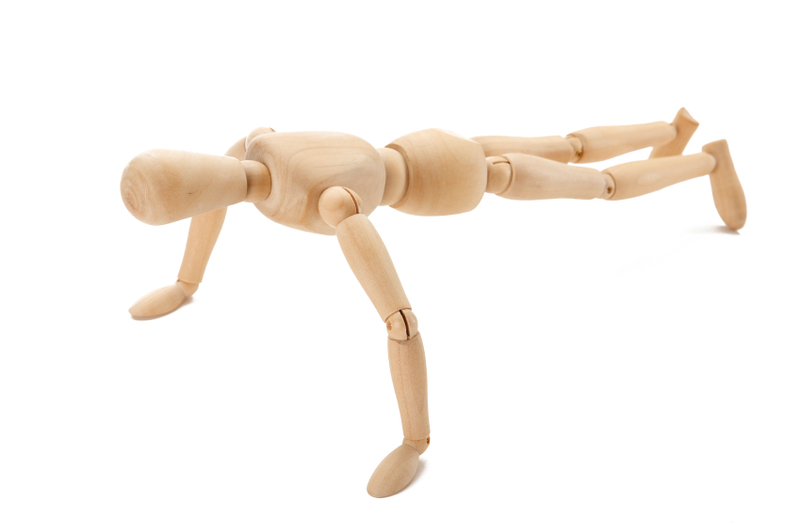 Chaturanga dandasana: easy enough if you're made of wood. For more than 25 years, I’ve felt bullied, oppressed and pushed around by Chaturanga Dandasana, the yoga push-up. I’d watch other people push up off the floor, or lower themselves from plank pose, and wonder why I was such a weakling. Yes, it’s a hard pose. Yes, after looking through a few hundred photos on Flickr, I can see that a well executed push-up is rare indeed. Still, I’m a yoga teacher. I’m supposed to be able to integrate my body, to follow lines of energy into progressively more difficult poses. Besides, Chaturanga Dandasana is not only on the Introductory II Syllabus for Iyengar yoga, it’s in boldface, which means it’s an important pose. Yet year after year went by with January resolutions to master Chaturanga that flopped to the floor like wet noodles by June. In brief, midway through a sun salutation, I felt unexpected strength in Chaturanga. And with a jolt of understanding, I realized that my new habit of sitting for meditation with my back to an outward facing corner had opened a door into the pose. At an outward facing corner, you work to keep your lumbar spine drawn back to the wall and up, your thoracic spine drawn away from the wall and up, and the back of your head drawn back to the wall and up. That’s the spine of Chaturanga. The only difference is that in sitting you can hold it long enough to set the pattern in your body. Like most people who experience a bolt from the blue, I’ve had moments when the light faded, and I just didn’t get it, all over again. But on the whole, it’s working, and I couldn’t be more pleased. So this week’s Five-Minute Yoga Challenge is to take a further step in the direction of Chaturanga, using the wisdom of the corner. If you haven’t tried sitting at an outward facing corner, do that first, to set the understanding in your body. Press your lumbar spine to the wall. Use your elbows to help lift your chest away from the wall and up. • Stand with your back to the wall, your feet about a foot away, your knees bent. • Press your lumbar spine into the wall. • Bend your elbows, palms facing. Slide your elbows down the wall. • From the backs of your elbows, push into the wall to lift your front chest forward and up, as you keep your lumbar spine glued to the wall. • Move the back of your head toward the wall, and up. • Make sure your weight is in your heels. • Take your hands to the wall, and gently push yourself away, keeping your knees bent, and the same shape in your back that you established at the wall. • Keeping the weight in your heels, lift your front thighs to straighten your legs. If you succeed in maintaining your wall-shaped back, you’ll feel work in your core muscles. Pretend your arms are only hinges, incapable of exerting force. • Turn to face the wall with your feet about a foot away, hip distance apart. • Bend your knees and reclaim your wall shape: lumbar back and up, thoracic forward and up, head back and up. • Bring your elbows to the sides of your waist. Reach your hands to the wall, arms straight. • Roll your shoulder blades down your back, away from your ears. • Check your wall shape again. With your legs firm and straight, press your navel toward your spine. Keep your navel pressed back toward your spine as you bend your elbows and let your chest come toward the wall. • Keep the pressure on, navel to lumbar spine as you straighten your arms. The sensation should be one of moving from your core, as though your arms were just hinges, with no active role to play. Chatur means four. 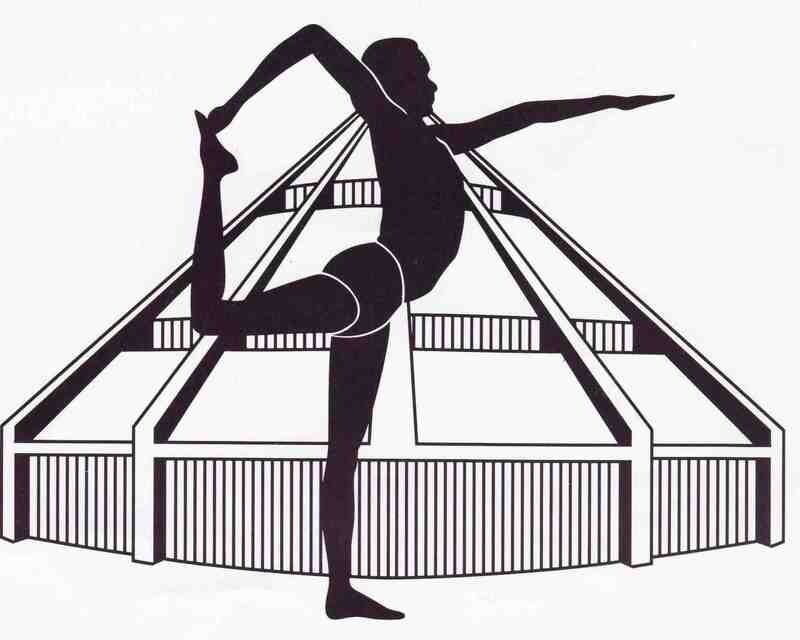 Anga means limb, as in ashta (eight) anga (limb) yoga. Danda is a staff, or a stick. When you can push away from the wall, arms passive, feeling your body as one straight line, as firm as a wooden staff, then you’ve made a substantial step in the direction of mastering Chaturanga Dandasana. Come to dog pose. Strongly lift your pubic bone toward your navel, which will activate your core. Holding that shape, move from dog pose to plank pose. Keeping your navel moving toward your spine and your shoulder blades away from your ears. Bend your elbows, and hover in Chaturanga. If you can stay one second with your core supporting you, and your shoulders away from your ears, that’s a triumph. Do you know someone who needs a Five-Minute Yoga break? Please spread the word through the Facebook and Twitter. To receive an email notice of every new post, sign up in the subscription box in the upper right hand corner. 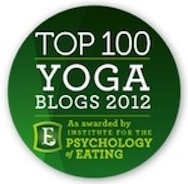 Eve – so excited to read about your experience building a better chaturanga dandasana. I have been trying the outward corner sitting over the last week and – dare I say – noticing some improvement. Recently learned about doing the pose with my hands on two wooden blocks as well and this is helping me get the feel of being in the pose. Holding the image of the wooden doll in my mind throughout! Corner sitting is a bit of a miracle, isn’t it? I’m glad to hear you’re making progress. You can super-charge chaturanga on two wood bricks by holding a third brick between your upper thighs. Squeezing the brick activates the legs and makes the whole pose stronger. Of course, that’s assuming you have an endless supply. . . . I love it that the wooden doll picture is helping out. They are useful creatures, those wooden dolls. While I can appreciate the more-common “wall sit,” I find it rather claustrophobic, as if I’m being pushed too far forward. Maybe the corner will give spinal guidance while allowing my shoulders and head to feel free. Love the wooden doll with movable joints! Where can I get one? Endless amusement for the Iyengar mindset! Good to hear from you! I’m not keen on the “wall sit” either, but mostly because it feels mushy somehow, if that makes sense. And I find myself using it for support, rather than guidance. I have tried a wall sit with a fairly thick dowel behind my back, which does a pretty good, less pokey, imitation of a sharp corner. 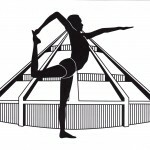 Unforeseen benefits have to be some of the best surprises in yoga. The wooden doll is an art supply item, used for teaching figure drawing. Opus Framing on Granville Island would have them for sure, in a variety of sizes. As I recall, they don’t have much pelvic movement. . . . I do have a real, live outward-facing corner in the very room that’s my “yoga space.” So I’ll give it a go. What I find interesting: BKS Iyengar categorized Chaturanga Dandasana as a backbend. The wooden doll’s permanently upright pelvis is either great inspiration or inhuman perfection! I can see the backbend links there – really what you’re doing is controlling the front body so the back doesn’t over arch. And I can see the virtue of learning Chaturanga first, and then backbends, although given my history with the pose, I still might be waiting to do my first backbend. Next post: Where Do You Find Your Inner Teacher?